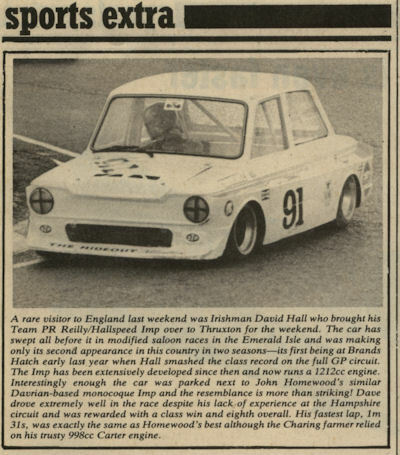 David Hall, Imp, Thruxton, 1212cc; #91; 1977? '78? A rare visitor to England last weekend was Irishman David Hall who brought his Team PR Reilly/Hallspeed Imp over to Thruxton for the weekend. 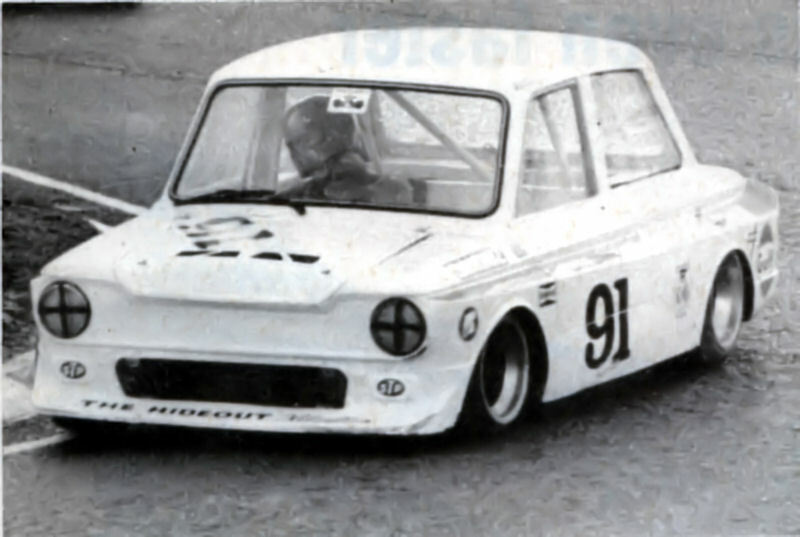 The car has swept all before it in modified saloon races in the Emerald Isle and was making only its 2nd appearance in this country in two seasons - its 1st being at Brands Hatch early last year, when Hall smashed the class record on the full GP circuit. The Imp has been extensively developed since then and now runs a 1212cc engine. Interestingly enough the car was parked next to John Homewood's similar Davrian-based monocoque Imp and the resemblance is more than striking! Despite his lack of experience at the Hampshire circuit, Dave drove extremely well in the race and was rewarded with a class win and 8th overall. His fastest lap, 1m 31s, was exactly the same as Homewood's best, although the Charing farmer relied on his trusty 998cc Carter engine.